Rediff.com » News » Would Vajpayee have approved of Modi-Shah's BJP? Would Vajpayee have approved of Modi-Shah's BJP? 'Vajpayee would not have approved either of the way the BJP now functions or of the thoughts that it entertains in its mind,' says T C A Srinivasa-Raghavan. Prime ministers always seem wonderful when the term 'former' is added before their title. Even Indira Gandhi, who caused so much harm to India, some of it permanent, has been held up as an exemplar by persons who were harmed by her. Atal Bihari Vajpayee, who passed away on August 16, isn't an exception to this general rule. But unlike many others he was a genuinely good man. You felt safe with him. Compared to the present leadership of the BJP he was a softie, a man who had a better sense of India than the current lot does. He never spoke of the Hindus as if they were a persecuted minority whose cause had to be promoted by persecuting the real minorities. Raj dharma to him meant something else altogether. Nor was he Machiavellian or cynical in the way his friend P V Narasimha Rao was, or lacking in courage like him. There was no bribing of MPs when he was prime minister. And, when he felt it was necessary, he went ahead with Pokhran II, unlike Rao, who allowed himself to be bullied by the US. We don't know what he would have done had the demolition of the Babri Masjid happened when he was in office. But given his resolve when faced with crises, it seems fair to suggest that he would have done his utmost to prevent it. He may have failed to prevent the demolition but at least he would have tried. Unlike Rajiv Gandhi, he was not a newcomer to politics when he became prime minister. So when he was faced with internal opposition -- and there was plenty of it -- unlike Rajiv he was able to keep the flock together. Certainly, no one deserted him the way V P Singh deserted Rajiv to launch a full frontal assault on him. Like Manmohan Singh, he also believed in speaking very little, even to his colleagues and officers. But there the similarity stops because he had a better sense of right and wrong. Certainly, self-interest did not occlude everything else. Nor did he feel beholden to anyone in the way Dr Singh did. That caused some friction between him and the RSS, but he was able to manage it without lowering the dignity of the office. Unlike Narendra Modi, he was not a particularly hard worker. The idea of working 15 to 17 hours a day appeared ridiculous to him. This left him with more time to reflect on what really mattered rather than relentlessly pursue targets. His was not a municipal mind. Certainly, he didn't see everything from the single prism of elections. Winning was important, of course, as it should be. But not at any cost, as it has now become. When he was in office many in his party despised him for his avuncular approach. One minister always referred to him as 'woh budda (that old man).' In this respect he was like Rao, who, too, was spoken of with derision by some of his ministers. Unlike Rao, however, he didn't feel the need to become president of his party. He left that job to others. Such inner confidence is rare in politics. (Mr Modi, too, has left the party to Amit Shah, but Mr Shah is not a rival in any sense of the word). Few prime ministers have faced the kind of political vicissitudes as Vajpayee faced. The first time that he became prime minister in 1996, he was voted out in Parliament in just 13 days. He lasted a bit longer the second time, but was voted out again -- this time by a single vote. No one who watched that no-confidence motion, which was brought because the AIADMK had moved out of the ruling alliance, can forget the stunned silence that followed when the result of the vote was declared. It was Vajpayee's tragedy that he was voted out a third time, this time not by politicians in Parliament, but the people in the general election of 2004. It was an absurd result, as absurd as the defeat by one vote in 1999. It still baffles the mind. Vajpayee withdrew from active politics voluntarily. Then he fell ill. His rival took over and could not win the general election of 2009. Nor could he outwit the challenger who appeared in 2013. Vajpayee was responsible for creating the challenger when he made him chief minister of Gujarat in 2001. 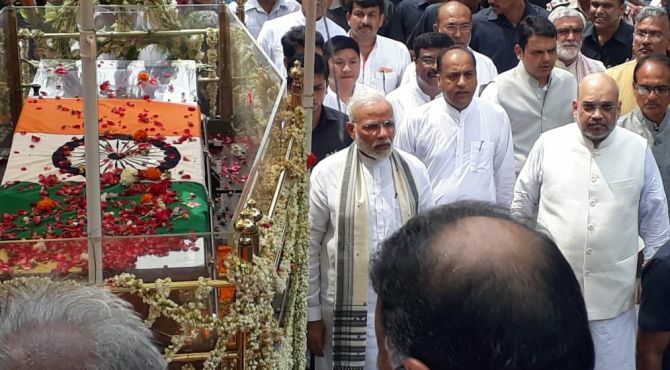 Under that challenger, who has gone on to become prime minister, the party that Vajpayee created and nurtured so lovingly has been transformed completely. Vajpayee would not have approved either of the way it now functions or of the thoughts that it entertains in its mind. What was Vajpayee like as prime minister?